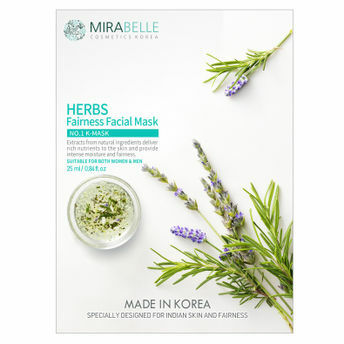 A dull, blemished and congested complexion is your skin concern, try using the Mirabelle Korea Herbs Fairness Facial Mask. Mirabelle Fairness Facial Mask with Herb Extracts is specially formulated for Indian skin. It delivers rich nutrients to the skin and provides intense moisture and fairness. It contains various extracts of Lavender, Lily, Rosemary and Chamomile which helps refine the skin texture and keep the skin pure and clear.